สันติ ชาญธนกิจวาณิชย์ และ สุเชษฐ์ สมุหเสนีโต. 2556. การวิเคราะห์สารประกอบระเหยให้กลิ่นสาคัญในน้ำมันหอมระเหยมะนาวไทยโดยการสกัด HS-SPME ร่วมกับการวิเคราะห์ Gas Chromatography-Olfactometry (GC-O) โดยเทคนิค detection frequency analysis. การประชุมเสนอผลงานวิจัยระดับบัณฑิตศึกษาแห่งชาติ หัวข้อเรื่อง “การวิจัยระดับบัณฑิตศึกษา : หนทางสู่การพัฒนาประเทศในบริบทประชาคมอาเซียน”. ครั้งที่ 27. วันที่ 28 กุมภาพันธ์ – 1 มีนาคม 2556. มหาวิทยาลัยนเรศวร. พิษณุโลก. หน้า 1702 – 1707. Supatsri Radomkit, Ekapan Kaewmaneechai, Pramote Kuwichitjaru, Busarakorn Mahayothee, Suched Samuhasaneetoo. Physicochemical changes during hot air drying of banana. In: The 9th Agro-Industrial Conference: Food Innovation Asia 2007: “Q” Food for Good Life, 14-15 June 2007. BITEC, Bangkok, Thailand. S. Samuhasaneetoo, S. Chaiseri, I.A. Farhat, T. Sajjaanantakul and R. Pongsawatmanit. 2006. Determination of microvoids of maltodextrin with various DE by the dual sorption model. pp. 275-283 In "Gums and Stabilisers for the Food Industry 13", Williams, P. A. and Phillips, G. O. (Eds.). RSC publishing. Cambridge. UK. Samuhasaneetoo, S., Chaiseri, S., Farhat, I. 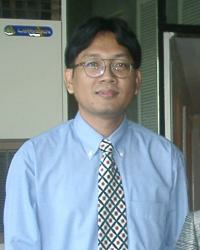 A., Sajjaanantakul, T. and Pongsawatmanit, R. 2004. Application of the “Dual Sorption” Model for water adsorption of maltodextrin various DE. Kasetsart J. (Nat. Sci. ),38: 515-522. Hamazaki, T., Thienprasert, A., Kheovichai, K., Samuhasaneetoo, S.2002. The Effect of Docosahexaenoic acid on Aggression/Hostility in Elderly Subjects. A Placebo-Controlled Double-Blind Study. Nutritional Neuroscience. 5(1): 37-41.